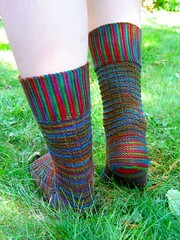 Keep On Knitting In The Free World: Pinata Socks! 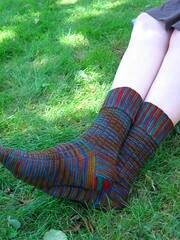 This is August 1st, which means it's time for another pattern release. 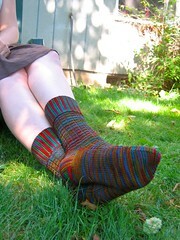 This offering is the August installment of the Socks For All Seasons Club 2010. Have you joined yet? Come on already! 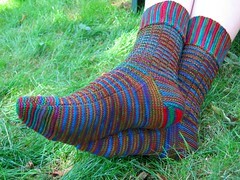 Ravelry member? Peek here. 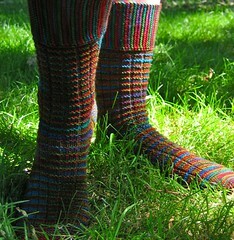 Welcome to summer, full of picnics, aguas frescas, piñatas and calcetines calientes! 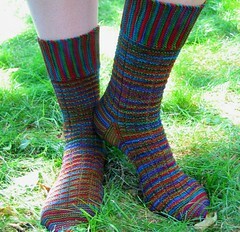 This top-down sock pattern is full of texture, especially created to showcase bright, variegated yarns. 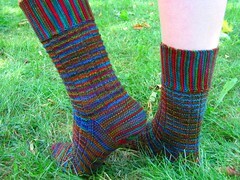 7 (8, 9, 10) inches 17.5 (20, 23, 25.5 cm) unstretched. 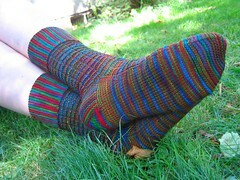 Will stretch to fit 8 (9, 10, 11) inches 20 (23, 25.5, 28 cm). Pattern includes a bonus crypto-gram puzzle! They look great!! Great job!